Discussion in 'The Lounge' started by BurlyShirley, Mar 5, 2008. Anyone who drinks this deserves to be kicked square in the ovaries. My wife likes it and she has ovaries. Well sharpen your boots stosh. It's okay for chicks to drink that. It's a freaking crime against humanity to for anyone to drink that. It's not a whine cooler even. It's "beer" with juice in it. WTF? We ask chicks to drink our jesus juice... I think we can cut them slack on whatever else they drink. So chicks and gay man law... it's okay to fruit your beer cuz you drink the g-zus gizz. 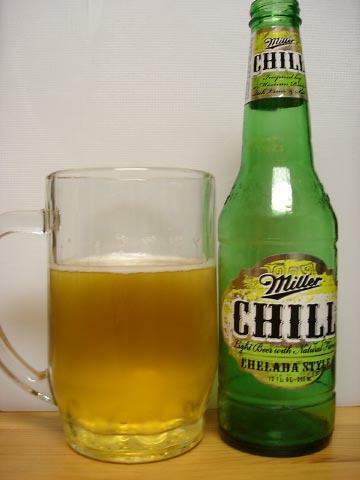 When I first saw that I thought the bottle said Miller Chili. Asked the GF who the hell would put chili in beer? Felt like a dork when she corrected me. American beer company trying to mass-produce a Mexican drink=BAD. http://en.wikipedia.org/wiki/Michelada , and a real michelada is not a chick drink. If it wasn't so ghey to quote other RM members I'd put that in my sig. But chili and beer in seperate service dishes consumed together = teh win. Actually putting beer in chili makes it taste pretty damned good. i have a few friends who decided to get 2 cases of that since they were extremely cheap. after i tried one, i immediately knew why the store was trying to get rid of them. I was cursing myself when I hit submit for not including that very valuable bit of information. We need a true false logic table to more clearly explain this. It's really, really fvcking good on a hot day. Especially when they serve it in 1 litre glasses. I dont really care about any of anyones past experiences here, okay? What's in that bottle is a disgrace. Despite my better judgment, it's good stuff. Put a little Splenda in it and it's rockin'! I agree. Anyone drinking that needs to be buried neck deep in box jellyfish. The Radler (cyclist) is a beverage consisting of a 50%/50% or 60%/40% mixture of lager beer and German-style lemonade. It was invented by the Munich gastronomer Franz Xaver Kugler in September 1922 when approximately 13,000 cyclists visited his tavern. His beer started to run out, so he cleverly mixed the remaining beer with lemonade and pretended he created the Radler especially for the cyclists so that they could ride home without the risk of falling off their bicycles. Nowadays the Radler is not just drunk only in Bavaria but across Germany and Austria. During the summer months, Radler is very popular there due to its reputation of being a thirst-quencher. It's a freaking crime against humanity to for anyone to drink that. natty ice is good compared to miller chill. is that a beer or my ex? I have a buddy that is a sales rep for Miller and he loves that crap. No wonder his wife divorced him. She divorced him cuz he's gay.